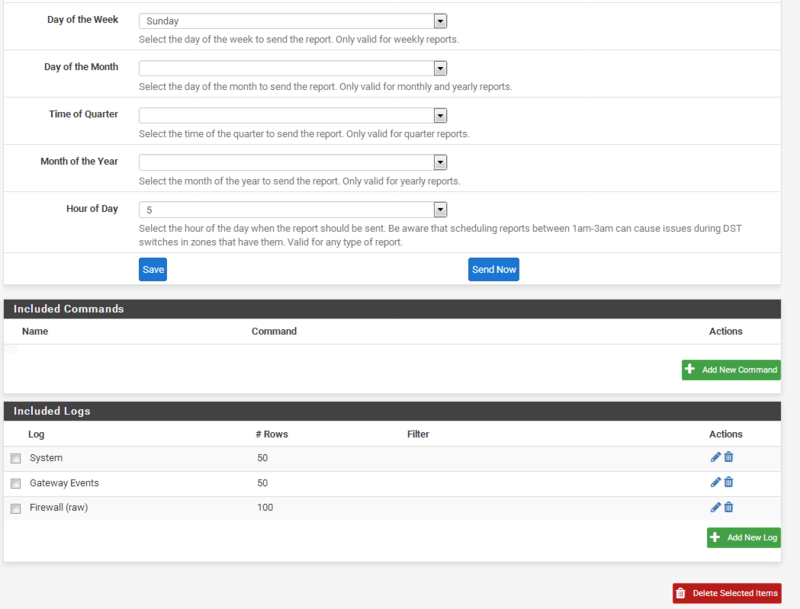 Hope you can create a thread also for how to generate a report on bandwidth usage per IP. Where can i send the beer! well writ! thanks! Good post ... thank you ..
One question though ... for mail report ... do I need to write the log locally on the Pfsense ...? This is a follow up guide to my prevourius guide: How-To Install and Configure pfSense 2.3 inside a VM using VMware workstation I will suggest you give that a look before you continue on this as that will give you a common reference on the network layout used in this guide, since this guide starts whit a fresh install of pfSense anyone can follow along but I will use the layout referenced in my last guide for consistency purpose. In this guide I will show you some of the basic features or services of pfSense 2.3 and how-to take advantage of them to improve your overall experience and ease of use for the LAN network. This is again only the basic settings and configurations of said features and services, as this guide series is not a comprehensive guide on how networking or pfSense functions, do not expect a full explanations of each feature settings, I will however try to cover the most important settings for you configure for the services to function properly. The reason you may want to configure Remote Access to your firewall is that you might not always be at the location whit physical access to your firewall, and something has happened that you need to address right away, then Remote Access is what allows you to connect from anywhere in the world from any device that has a web-browser and internet connectivity. 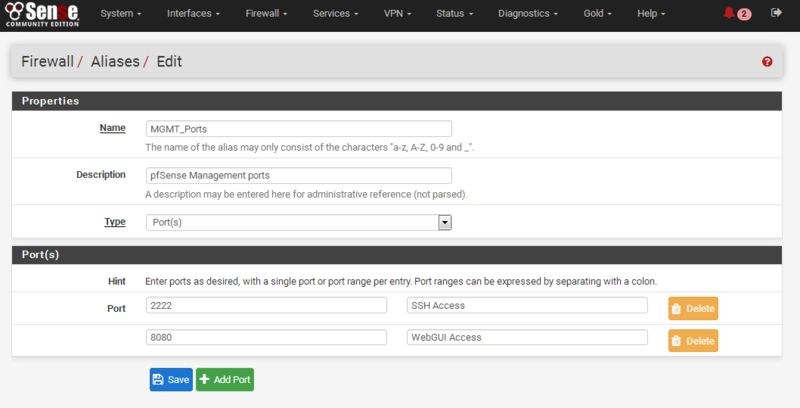 Warning: The ports 8080 and 2222 for WebGUI and SSH is well-known managements ports by administrators and hackers and I only use them for guide purposes and you should select ports that matches your network preferences. 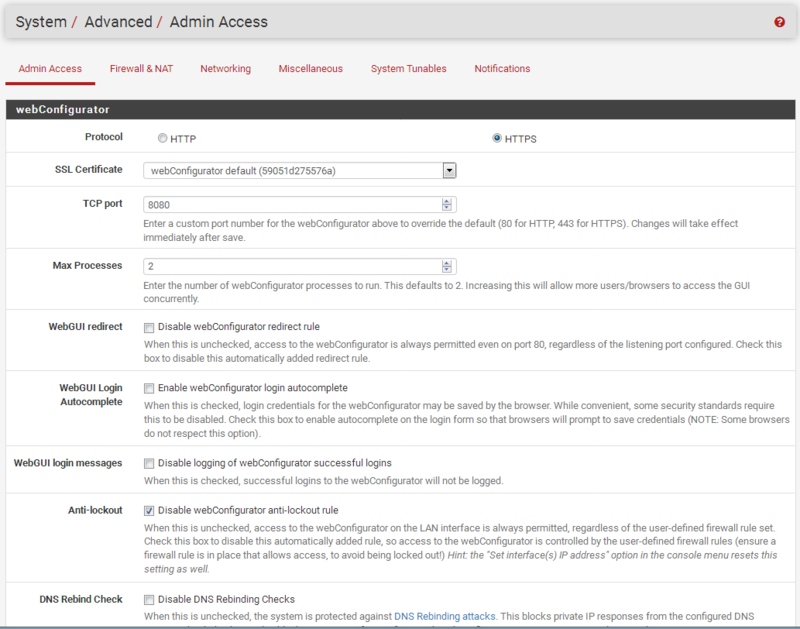 Now you would need to wait about 30sec for it to apply the new settings and redirect and refresh your web-browser to the new port, your new method of accessing pfSense would be by using the following web address: https://10.99.99.1:8080 from the LAN interface. Network(s) based: You can specify whole network segments and subnets as a single entry, but you can also specify a single IP Address. If I only want access from my computer whit IP 192.168.1.199 I need to set that as a /32 network and all single devices need to be specified by IP-address+/32 in the alias, this should only be used if you have a static IP address on the computer as if the IP change after a reboot or something you will no longer have access to your firewall. 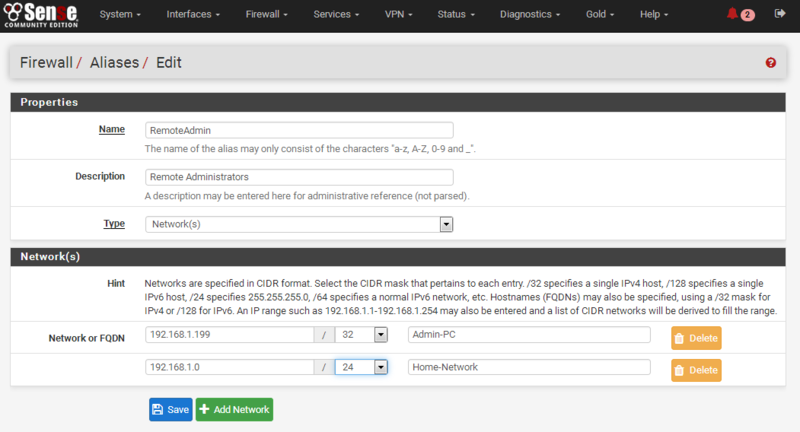 If I would like to give every one that connects to the D-Link Home-Router access to connect to pfSense I need to specify the Home-Router LAN network of 192.168.1.0/24 in this alias, whit this set anyone whit the IP-address from 192.168.1.1 to 192.168.1.254 will be able to connect to your firewall and manage it. As you can see in the picture below I have added both 192.168.1.199/32 and 192.168.1.0/24 and only 1 of them is really needed as 192.168.1.199 is part of the 192.168.1.0/24 network I only added it for comparison reason. This is all there is to setup Remote Access and Management of your firewall, Just a word of warning if you intend to do this when directly connected to internet and not behind your ISP or Home-Router you need to be very specific of what IP addresses and networks you allow to connect and you should use a custom username and strong password. 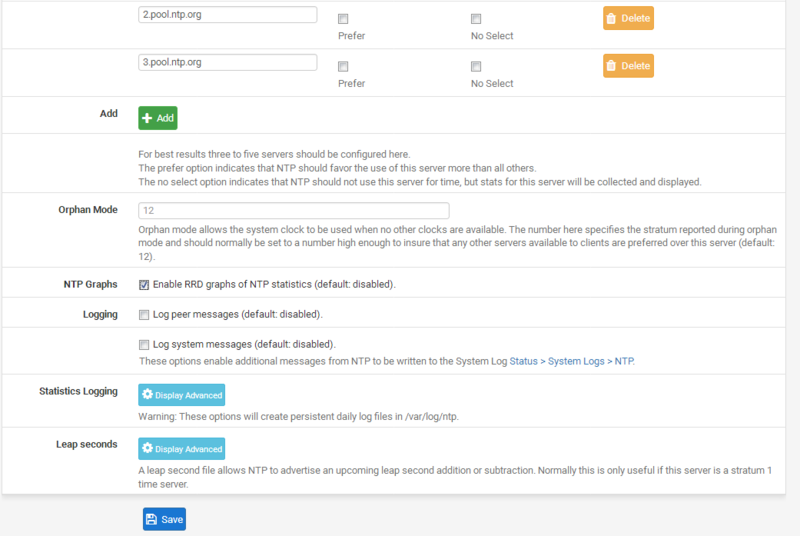 The NTP Service (ntpd), is configured at Services -> NTP, allows pfSense to act as a Network Time Protocol server for a network, and also keeps the clock in sync against remote NTP servers as an NTP client itself. Before enabling this service, ensure that the router's clock keeps fairly accurate time. 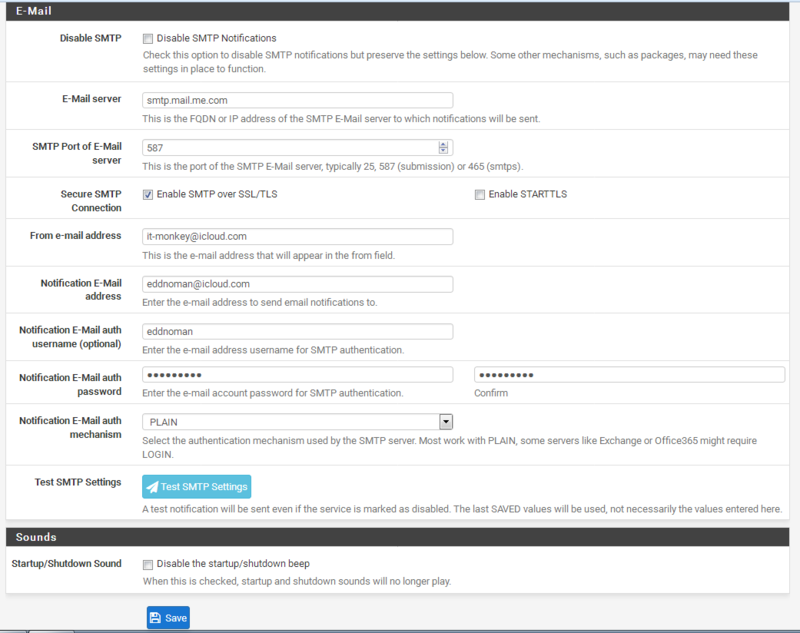 By default the NTP server will bind to and act as an NTP server on all available IP addresses. 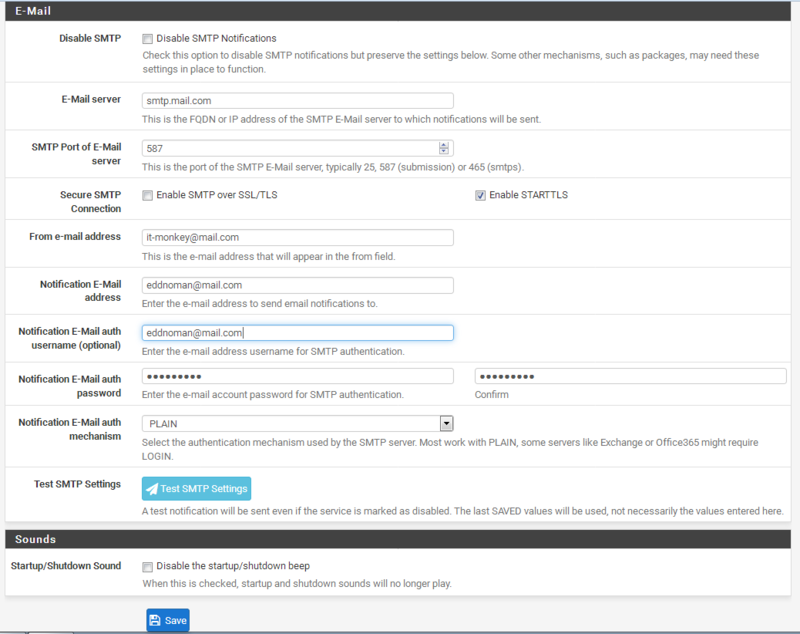 This may be restricted using the Interface(s) selection on Services -> NTP. This service should not be exposed publicly. Ensure inbound rules on WANs do not allow connections from the Internet to reach the NTP server on the firewall. 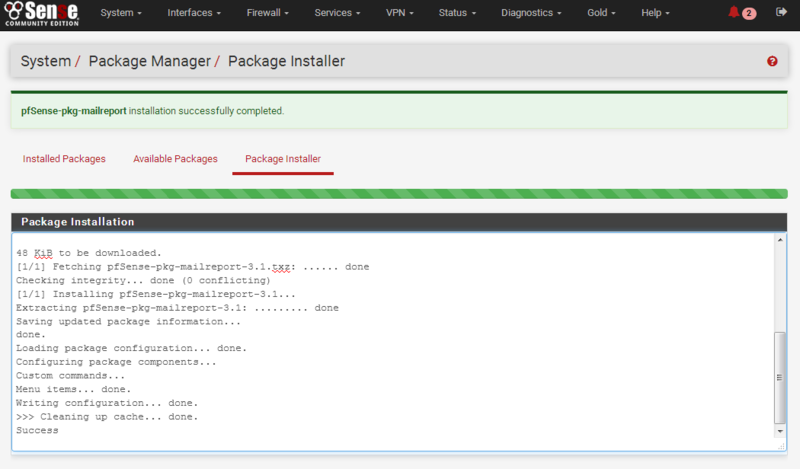 And that is all it is to setting up NTP Service of pfSense. What are UPnP and NAT-PMP? UPnP is short for Universal Plug and Play and is commonly found on Windows, BSD, Linux systems and common home routers. NAT-PMP is short for NAT Port Mapping Protocol and is similar to UPnP but found more commonly on Apple devices and programs. A growing number of programs support both methods. 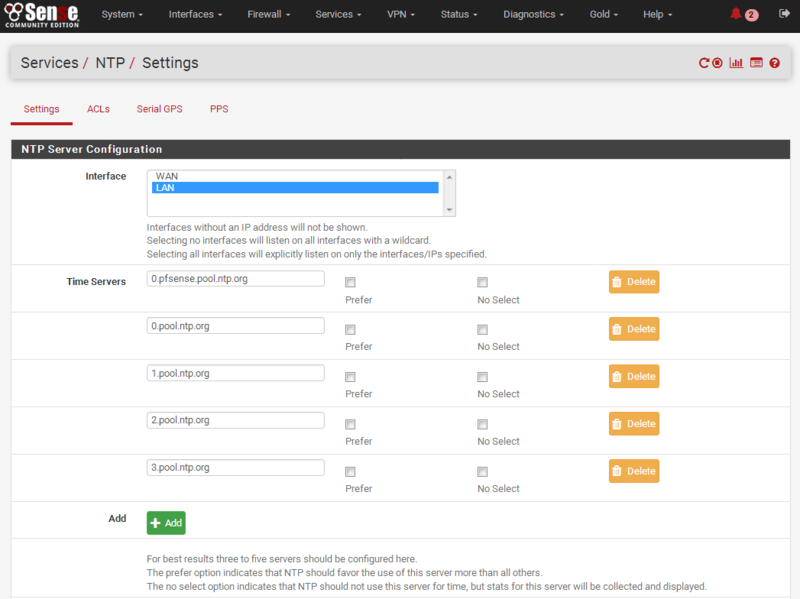 pfSense supports both, and the service may be configured at Services -> UPnP & NAT-PMP. 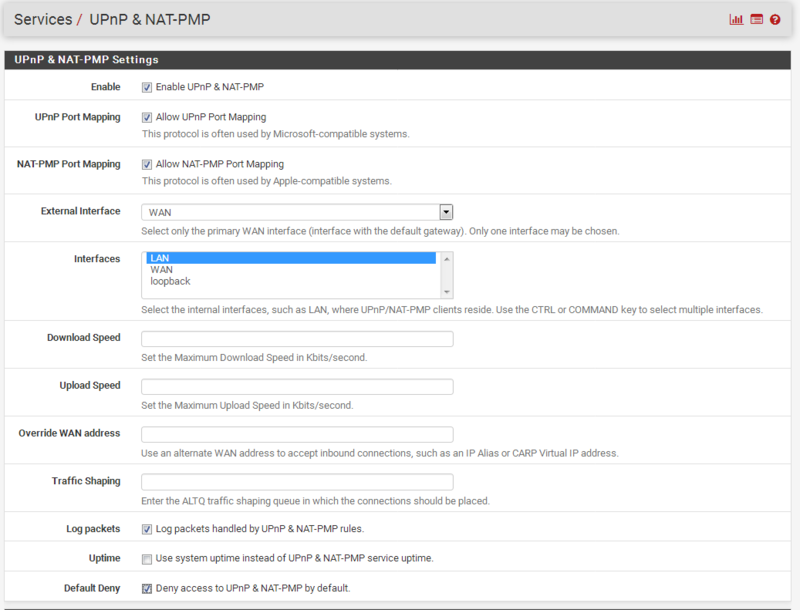 UPnP and NAT-PMP both allow devices and programs that support them to automatically add dynamic port forwards and firewall entries. The most common uses are in gaming systems (XBox, PlayStation, etc) and Bit Torrent programs like µTorrent, which both rely on allowing inbound connections to a local service. When UPnP or NAT-PMP are enabled, use only devices and programs which are trusted. These mechanisms will allow these entities to bypass the firewall to allow incoming connections with no additional control or authorization. Do not be surprised when this happens. 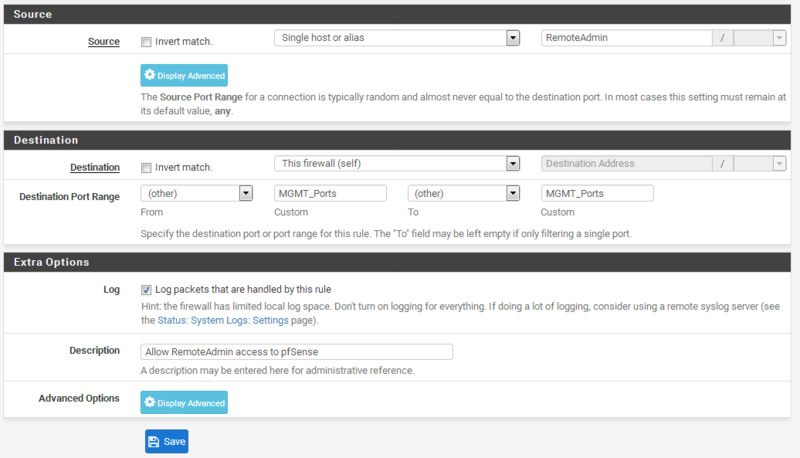 Access permissions for the service may be crafted in the options on pfSense. The format of these is shown in the GUI at Services > UPnP & NAT-PMP in the User specified permissions boxes. Using these, access could be restricted to a specific workstation or device. Unbound DNS Resolver is a validating, recursive and caching DNS resolver. It provides various modules so that DNSSEC (secure DNS) validation and stub-resolvers are possible. 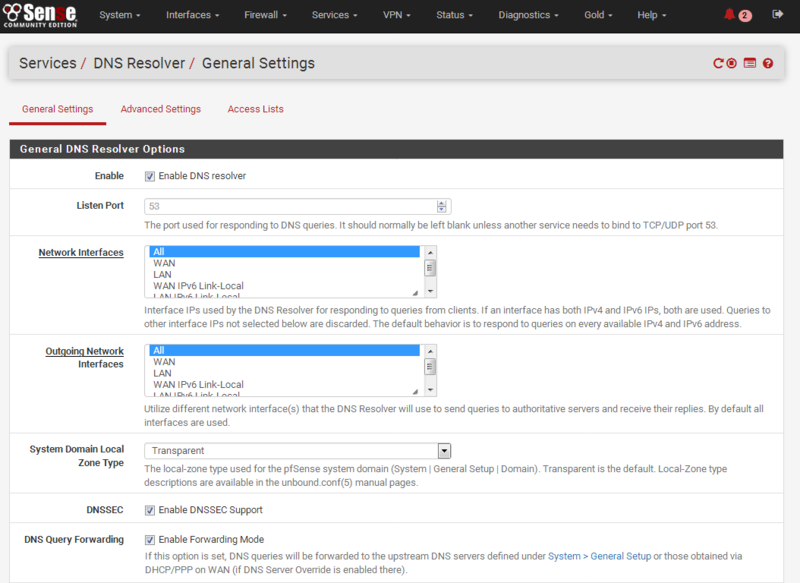 Unbound was integrated into the base system in pfSense 2.2. Unbound is also the default DNS Resolver. 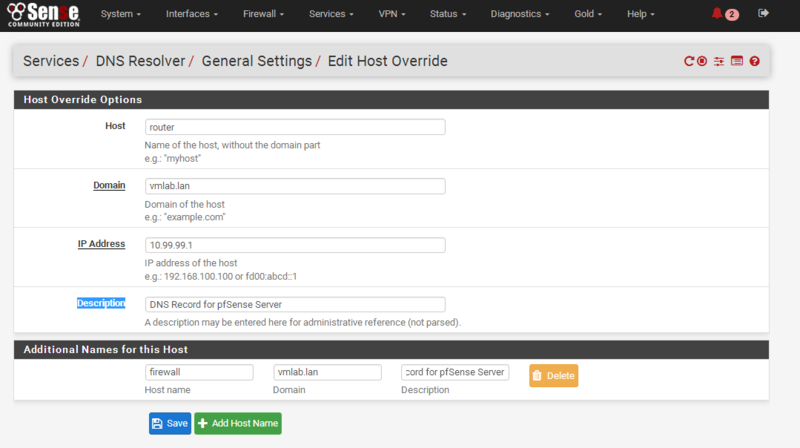 Now whit the above settings you would have a working DNS Resolver setup, however one of the advantages and cool thing of having your own DNS Resolver service running in your network is that you can assign your own custom domain addresses for your devices, to illustrate this option I am going to convert the access address of pfSense to use the URL of router.vmlab.lan and firewall.vmlab.lan instead of having to remember 10.99.99.1 IP address for it, to do this we use the Host Override Option. 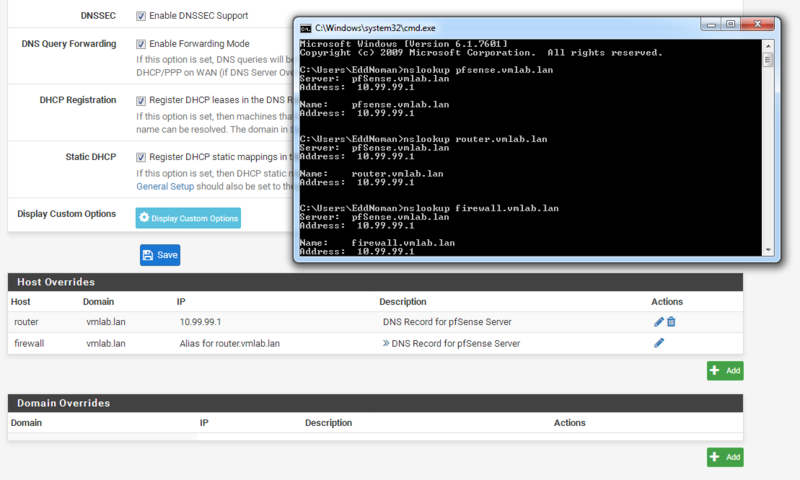 Hopefully you now see a lot of advantages of using the DNS Resolver in your network. Dynamic DNS (DynDNS), found under Services -> Dynamic DNS, will update an external provider with the current public IP address on the firewall. This keeps a constant DNS hostname, even if the IP address changes periodically. 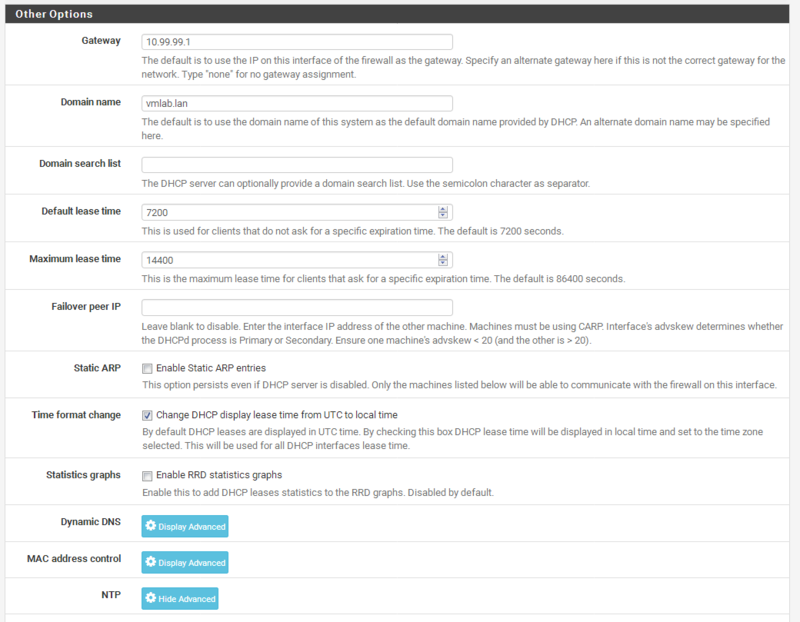 Whenever an interface changes in some way, DHCP lease renew, PPPoE logout/login, etc, the IP will be updated. There are many free DynDNS services out there, and pfSense supports more than 15 different providers. In addition to the normal public services, pfSense also supports RFC 2136 DNS updates to DNS servers. 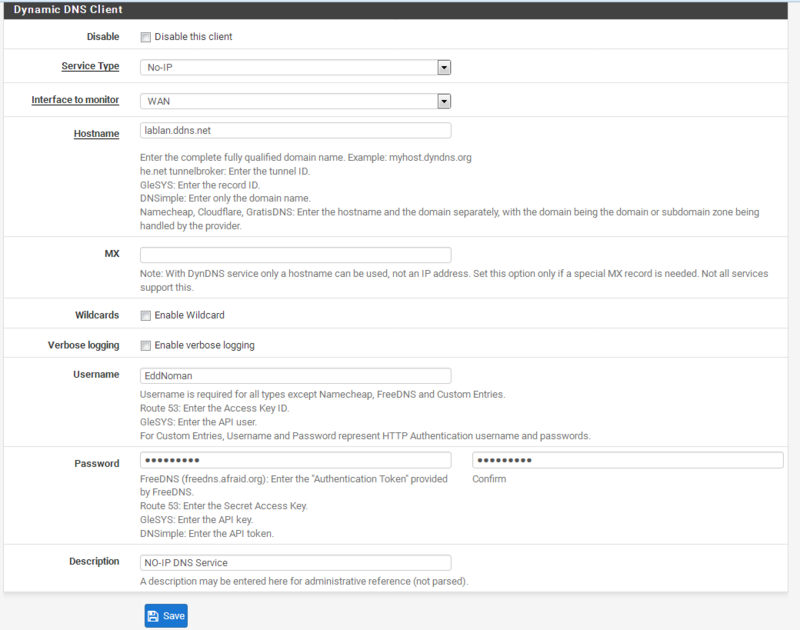 In currently supported versions of pfSense, the DynDNS client supports using multiple DynDNS and RFC 2136 clients. These can be used to update multiple services on the same interface, or multiple interfaces. There are two tabs under Dynamic DNS, one for DynDNS providers, and one for RFC 2136 servers. Each tab has a list of currently configured clients, which reflects not only their configuration but also their status. Additional clients can be managed from these lists. 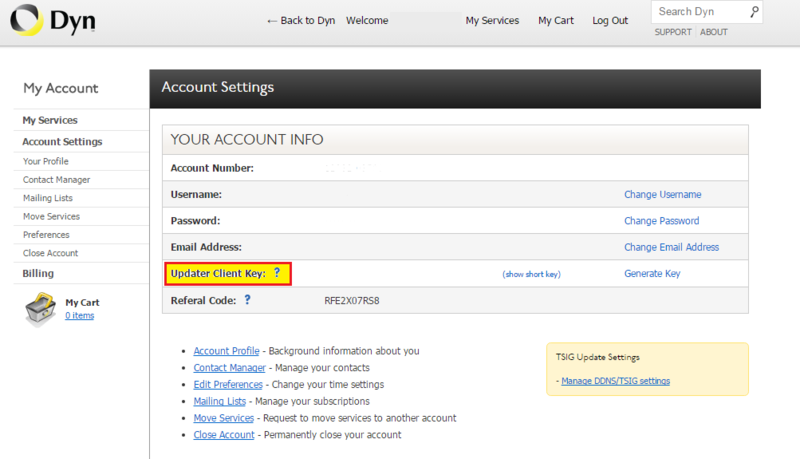 When editing a DynDNS client, first pick a DynDNS service provider, then choose Interface with the IP address to update. 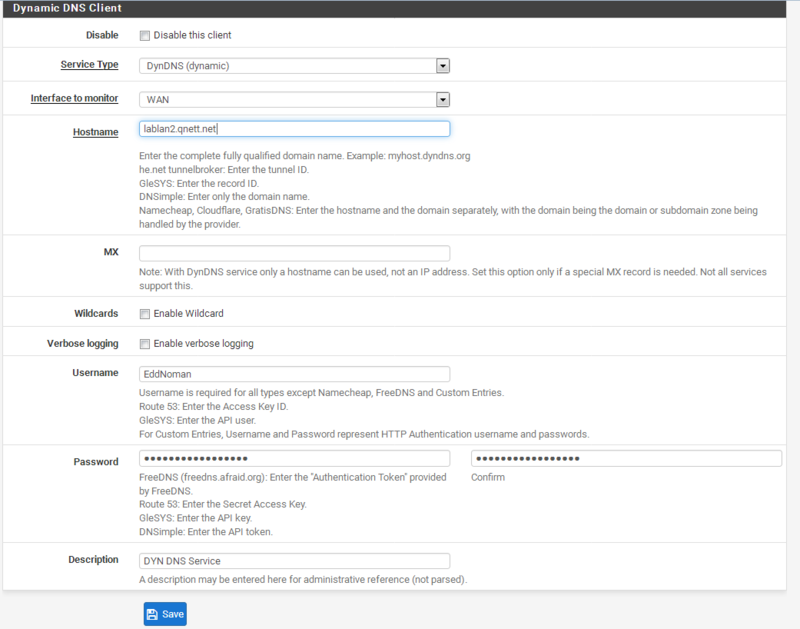 Enter a hostname, username, password, and description. Optionally, an MX record and wildcard support may be enabled depending on the provider. When editing an RFC 2136 client, first pick the interface with the IP to update, enter a hostname, Time To Live (TTL) for the DNS record, Key name (which must match the setting on the server), Key type of Host, Zone, or User, an HMAC-MD5 key, the DNS server IP address, and a description. TCP transactions may optionally be used instead of UDP. 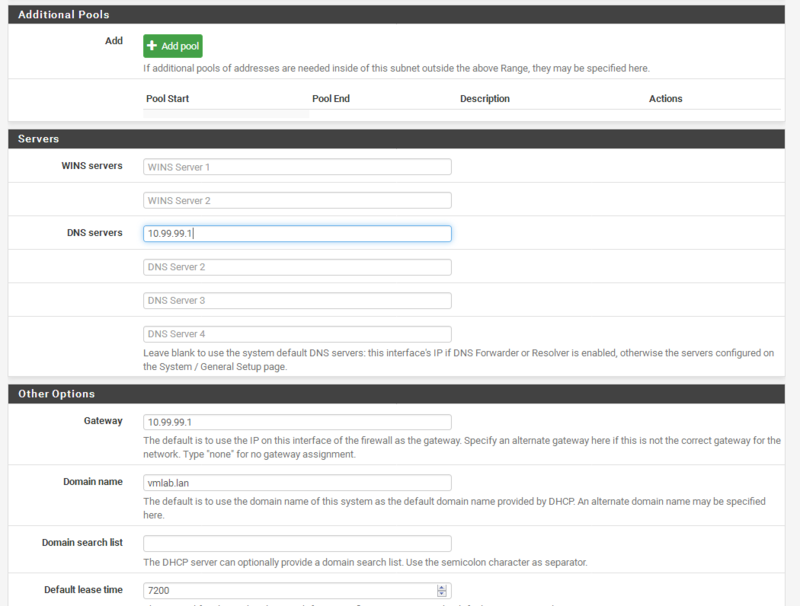 As you can see from these pictures it is not hard to setup it is just a matter of filling in the correct provider information about your domain and account detail, also as you can see from the picture there is no issue whit having multiple providers and DNS entries pointing to the same router and firewall. If you do not have any Dynamic DNS provider or account yet, I have a 15% off referral code for DYN DNS (dyn.com) that you can use, if you sign up for DYN DNS then I strongly recommend the Managed DNS Services as then you get your own fully fledged DNS Service whit all the features and benefits of your own public DNS Servers. 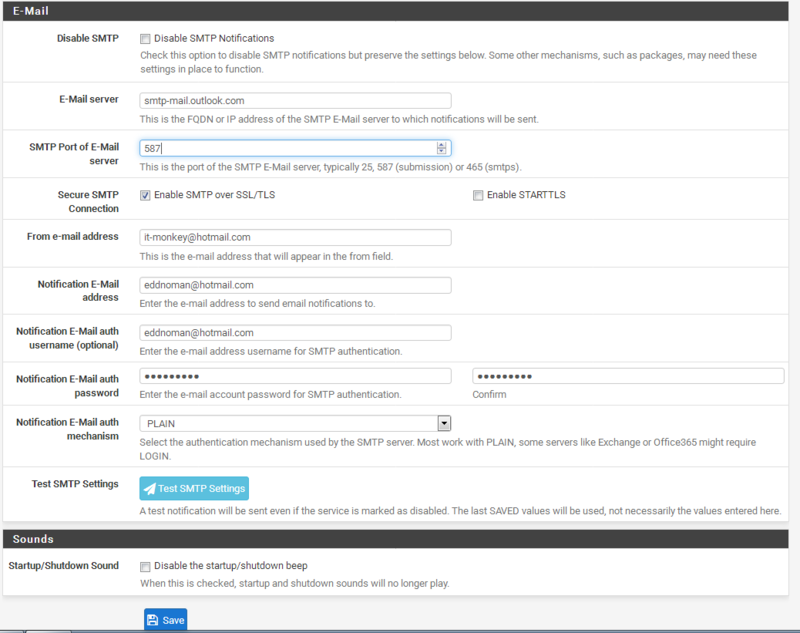 The DHCP server in pfSense will hand out addresses to DHCP clients and automatically configure them for network access. 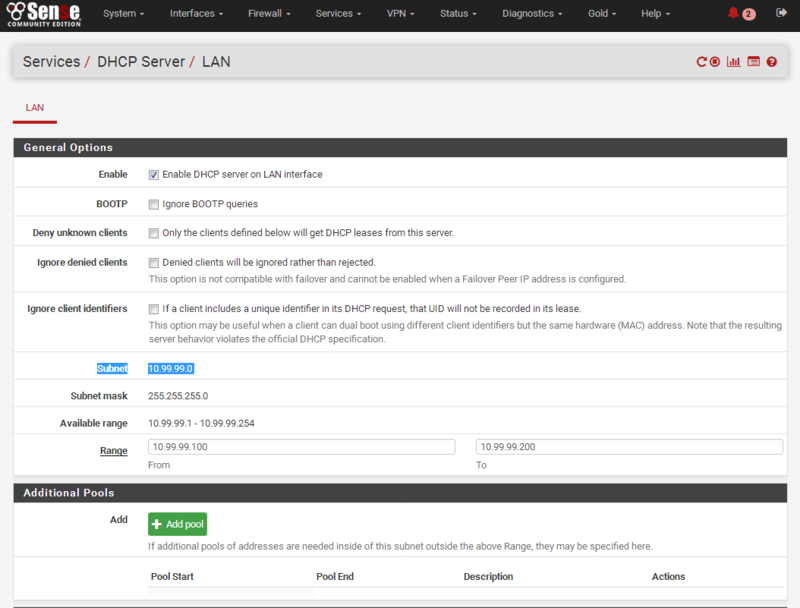 By default, the DHCP server is enabled on the LAN interface. 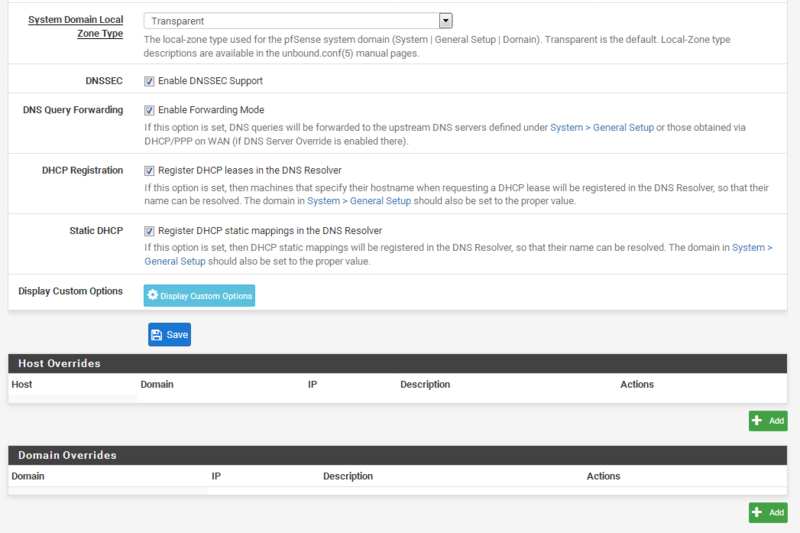 The DHCP server page, found under Services -> DHCP Server, has a tab for each available interface. The DHCP daemon can only run on interfaces with a Static IP address, so if a tab for an interface is not present, check that it is enabled and set with a Static IP. The DHCP server cannot be active on any interface if the DHCP Relay service is in use. For each Interface, there are many options to choose from. 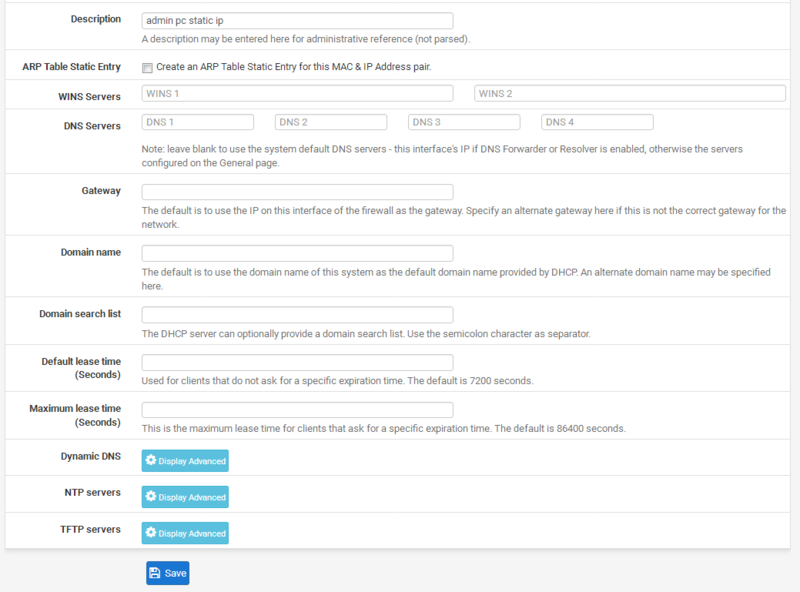 At a minimum, the Enable box must be checked on the interface tab and an address range (starting and ending IP addresses) to use for DHCP clients must be defined. The other settings may be configured, but are optional. 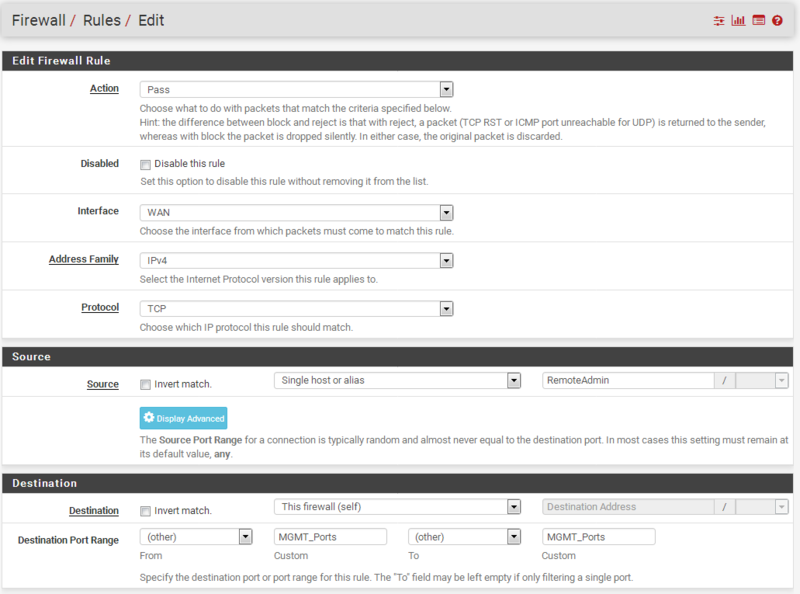 Each option is explained in more detail on the page and also in The pfSense Book. See the DNS Forwarder article for information on the default DNS server behavior. Some other options which may be set for clients include TFTP server, LDAP URI, and the ability to add in any custom DHCP option number and value. 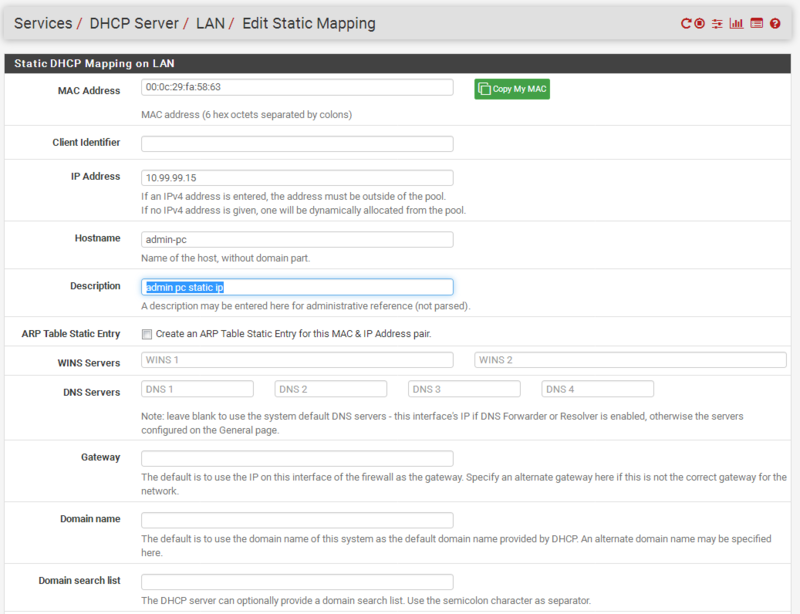 Static IP mappings can be added at the bottom of the DHCP server tab for a given interface. As you can see from this page there is a lot of information and configuration parameters you can give your devices and computers through the use of DHCP Server that is not covered in common Home-Routers that you can pick up at your local electronics or computer shop so you need to do some research if you want to use some of the other options as I am only covering what is necessary for the services we have configured in this guide. As you can see there is a lot of options that can be assigned on a per device \ IP basis when you create a static IP assignment, but the 2 main thing to keep in mind is that MAC Addresses are unique to every network device and the IP Address need to be outside of what you assigned for the DHCP Range and those IPs are already in use by the server and would make it a IP conflict. 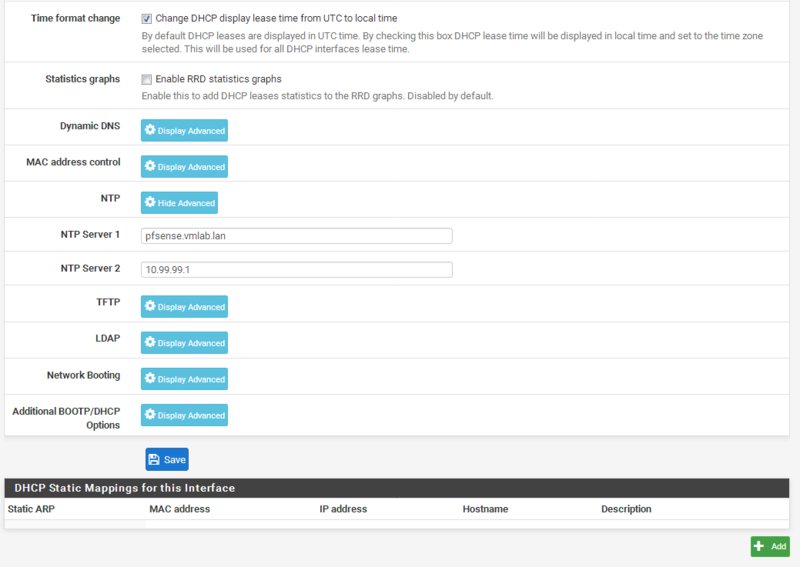 And that is all there is to configure DHCP and or a Static IP in pfSense. 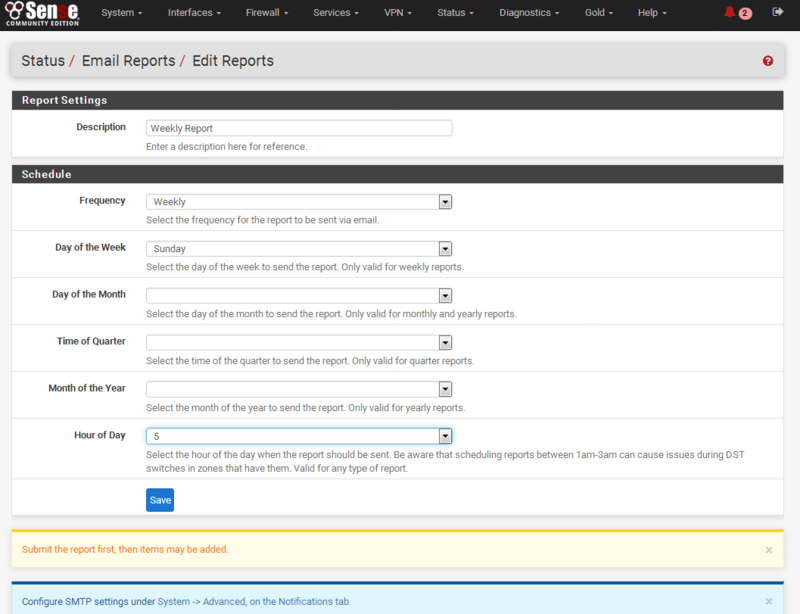 Now I am going to cover something most people neglect to setup in their home or small networks and that is email alerts and reports on events whit the add-on Mailreport as it allows you to setup periodic e-mail reports containing command output, and log file contents, this is a very useful tool to use and see what is going on whit your firewall and network so that you can be ahead and proactive against any issues that are on the rise and all this from the comfort of your email inbox. Now since this is about sending emails the configuration for this package is very dependent on what email provider you have and I have gotten this to work whit the following providers: Google Gmail, Microsoft Hotmail (live\outlook), Yahoo Mail and Mail.com and it will work for any provider that allows you to connect to it using SMTP and IMAP applications like Thunderbird or Offic-Outlook. 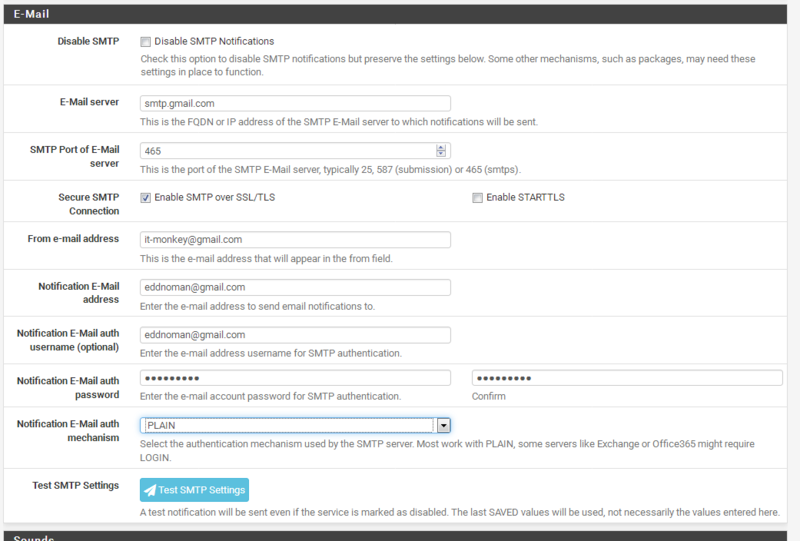 Now make sure you save the settings before you test the SMTP settings. You should see a green bar at the top saying successes if everything is working if not it will be red whit an indication of what went wrong, in most cases that would be a case sensitive username \ password or that the provider changed ports. Now some text should fly over the screen and a progress bar should follow until the installation is done, this should only take a minute or so to complete and you should see a installation success message when done. That is it for this guide.